We cook everything "a la minute" - China Restaurant ZEN in Adliswil, near Zurich. Famous for Peking duck and authentic Hong Kong style dim sum with organic ingredient and vegetarian menus. We cook everything "a la minute"
Which means that most of our dishes are prepared with fresh ingredients in the wok. 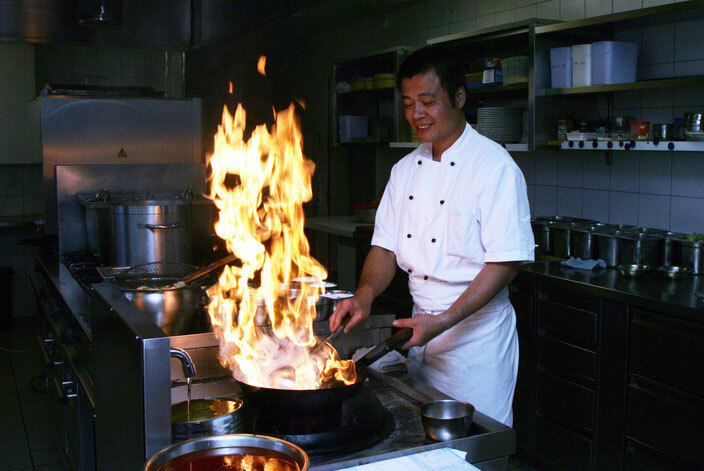 Master Chef and owner of the restaurant, Kin Chuen Li prepares all our delicacies himself. ZEN offers a traditional Chinese cuisine, which is little known in Western Europe, cooked to a high standard for gourmets, according to the principle “small but good”. As also reflected in the simple yet elegant ambience. You can expect a very healthy, creative cuisine with all the dishes made from fresh ingredients of highest quality, and a menu, which changes based on which vegetables are in season.